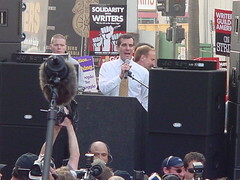 City Council President Eric Garcetti (left) reaffirms L.A.’s support of the WGA. An estimated 6,500 (my estimate) WGA, SAG, and other union members marched down Hollywood Blvd. 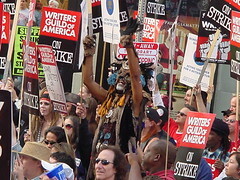 today in a show of solidarity for the Writers Guild strike, now in its third week. While a solid showing, this will most likely go down in the record books as the largest number of Starbucks carried during a single demonstration… if anyone was counting. Alicia Keys kicked off the proceedings at Hollywood and Vine, performing two songs and declaring that she too is a writer. 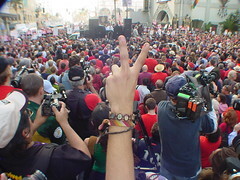 The march then proceeded West towards the Chinese Theatre, led by three Teamsters branded semis with trailers. Dozens of marchers were seen ducking into a Starbucks halfway along the route, returning moments later to walk with fresh lattes. I distracted LAist’s Tony Pierce from this tall blonde ring girl by asking him to pose for Metroblogging. Next PostNext There Was Something In the Mist!